Jerusalem’s iconic symbol is the gleaming Dome of the Rock, whose golden roof has dominated the Temple Mount for centuries. 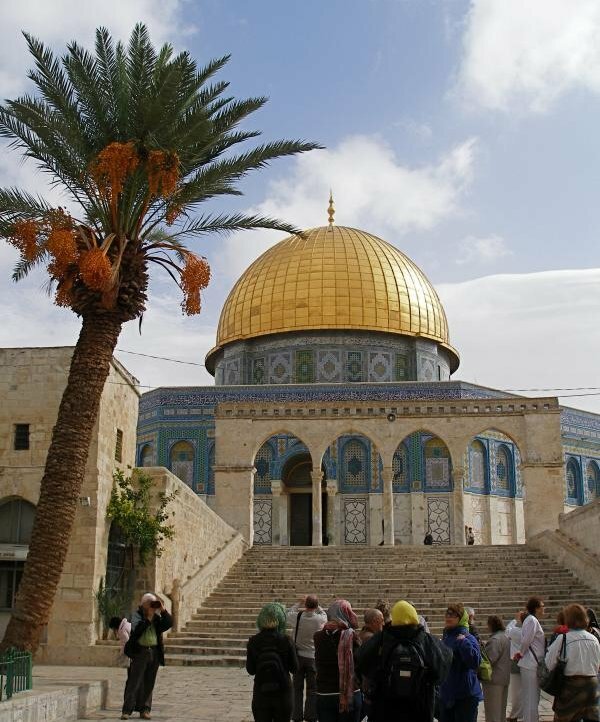 This Islamic holy place stands on a site that is sacred to Jews, Christians and Muslims. • To Jews, this is where Abraham, in a supreme act of faith, prepared to offer his son Isaac on Mount Moriah. It is also the place where the Temple once stood. • To Christians it is where the baby Jesus was presented in the Temple; where he was found among the teachers as a 12-year-old; where he later prayed and taught — and drove the money-changers out of the Temple precincts. For most of the 12th century, when the Crusaders controlled Jerusalem, the Dome of the Rock was actually a Christian church. • To Muslims the Dome covers the sacred rock where Muhammad prayed and went to paradise during his Night Journey from Mecca to Jerusalem and back to Mecca on the winged steed called Al-Burak. 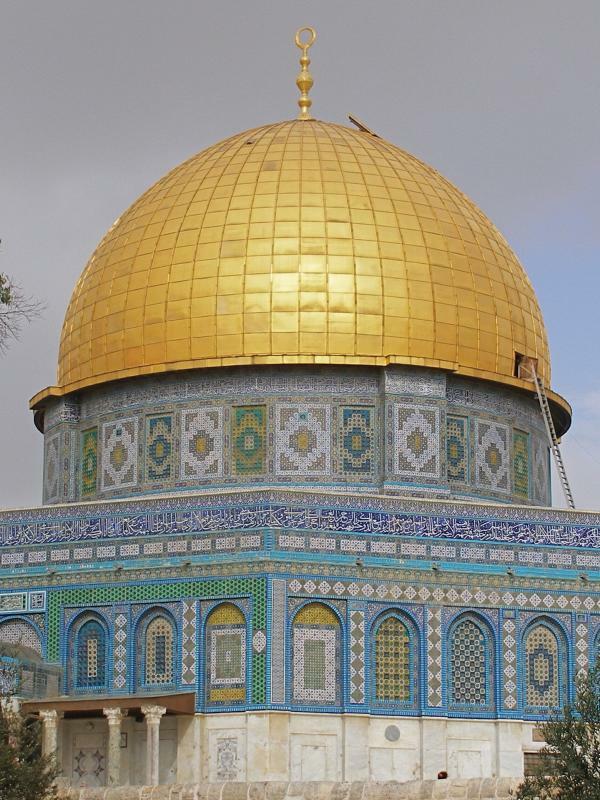 The Dome of the Rock was the first major sanctuary built by Islam. 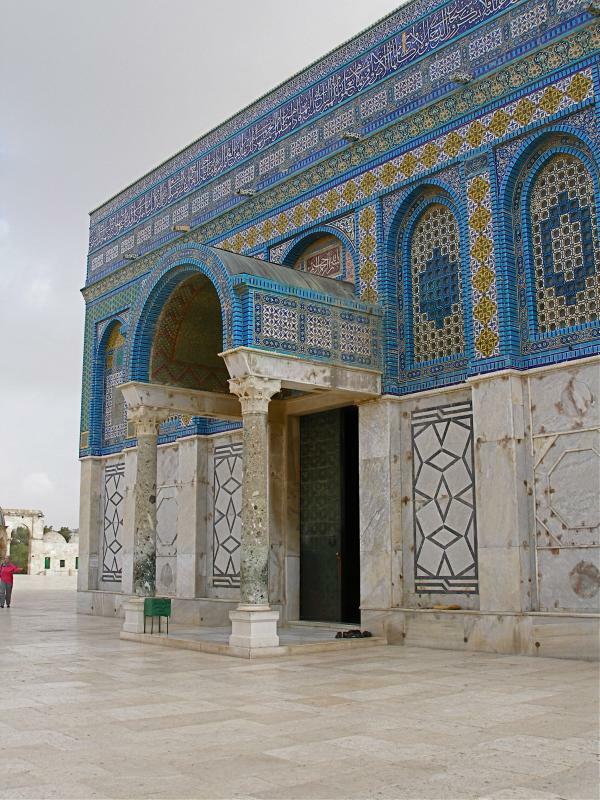 Although it is sometimes erroneously called the Mosque of Omar (a companion of Muhammad) it is actually not a mosque but an adjunct to the nearby Al-Aqsa Mosque. A building of extraordinarily harmonious proportions, the Dome of the Rock is 20 metres across and more than 35 metres high. It was commissioned by Caliph Abd al-Malik and completed in AD 691. Its rich ornamentation was the work of Syrian Christian artists. The roof is covered with gold-plated anodised aluminium. Inside, the sacred rock is protected by a 12th-century cedar wood screen. Crosses on some of the columns show that they were taken from churches. A high reliquary beside the rock is believed to contain a hair of Muhammad’s beard. On the southern side of the rock, steps lead down to an ancient cave, known as the Well of Souls, to which many Jewish and Islamic legends are attached. The Crusaders used the cave as a confessional. Current Arab tradition suggests that Caliph Abd al-Malik built the Dome to commemorate Muhammad’s Night Journey and ascension to paradise. Older sources indicate that the caliph’s purpose was two-fold: 1) to emphasise the superior truth of Islam over both Judaism and Christianity; 2) to outshine the splendour of Christian churches. A 10th-century account says he was concerned that the Church of the Holy Sepulchre might “dazzle the minds of Muslims”. The dimensions of the iconic golden dome match those of the Holy Sepulchre’s dome. The Dome’s “founding inscription” runs for 240 metres in a single line of Kufic script (the oldest Arabic writing in existence) along the top of both sides of the inner octagonal arcade. By building the Dome of the Rock, Caliph Abd al-Malik symbolised the transformation of Jerusalem — once a Jewish city, then a Christian city — into a Muslim city. Today, of course, the city is both culturally and religiously diverse. Open: Non-Muslims are permitted to enter the Temple Mount through the Bab Al-Maghariba (Moors’ Gate), reached through a covered walkway from the Western Wall plaza, during restricted hours. These are usually 7.30-11am and 1.30-2.30pm (closed Fridays and on religious holidays), but can change. Modest dress is required. Non-Muslims are not normally allowed into the Dome of the Rock or the Al Aqsa Mosque. Non-Muslim prayer on the Temple Mount is not permitted.